In this dice game, our professor needs your help! He is having problems with some of the formulas in his lab. Help the professor out of this mess by throwing the dice and filling up the categories as best you can. He would be especially happy if you could score a 5Dice, the highest combination of the game! 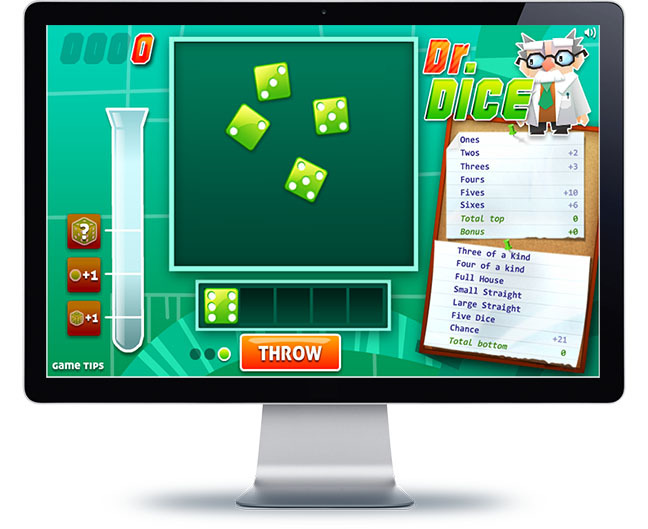 Our professor would be especially happy if you could score a 5Dice, which is the highest combination of the game! Throw the dice three times in each turn and choose which ones you would like to keep and which ones you would like to throw again. You must choose in the score chart the possible combination that you have made in order to achieve the highest score.If you get 5 dice with the same value, you have made a 5Dice, the highest score! The game only ends when all the combinations are crossed off in the score chart. In this version, you can use some special combos to make it easier to increase your score!